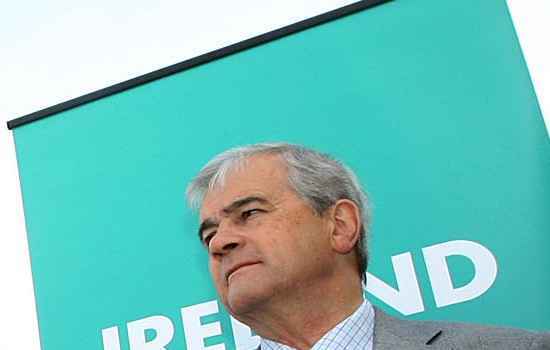 Irish politicians who voted to make blasphemy illegal in 2009. This is the most embarrassing vote by Irish politicians on any issue since 1985. 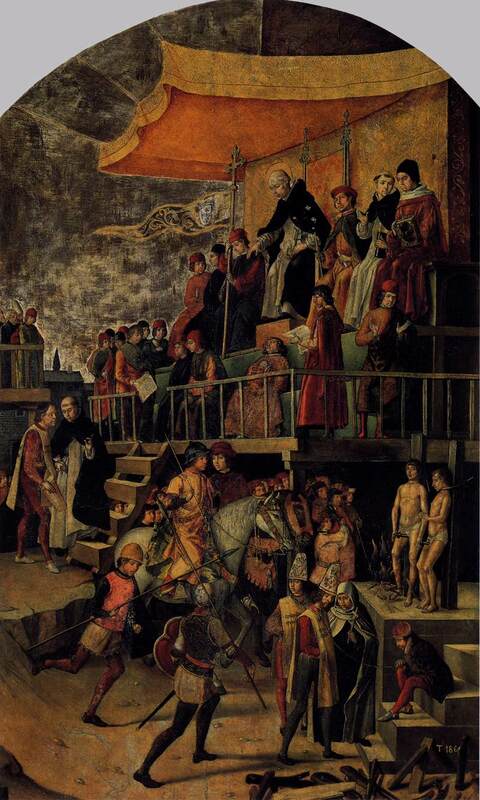 Saint Dominic (founder of the Dominicans) presiding over an auto de fe. The Dail itself then passed this without a vote on 8 July 2009. Despite widespread national interest in and opposition to this bill, with media debates and national campaigns against it, the FF-Green-PD government refused to allow any proper debate on it in the Dail, and managed to railroad it through without a vote. 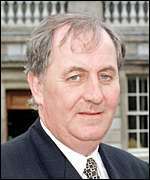 Dermot Ahern even said on 9 July 2009: "I do not know if I ever received as many e-mails on any other issue in my political career as I did on this. ... They showed outrage. They were all outraged." And yet he refused to allow a Dail debate on this! Program on the blasphemy law, RTE, Prime Time, 12th January 2010. Thomas Byrne, FF TD, who voted for the law in the Dail Committee, defends his role in introducing a working blasphemy law. He actually declares that he doesn't even believe in the law, and yet he helped introduce it! Islamic reactionary Ali Selim (who believes in sharia) sits beside him, welcoming the law: "you are entitled to hold this value sacred to you, and nobody should degrade that value, full stop". An anonymous, anti-jihad, Irish atheist responds to Thomas Byrne and Ali Selim: It would be nice if the Irish media gave Ali Selim a hard time like this. 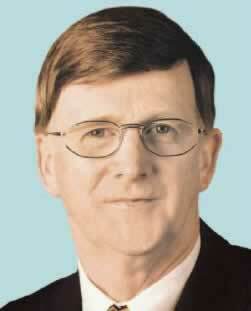 Jim Walsh, FF Senator, who voted for the law, is almost alone in Fianna Fail as really defending it. 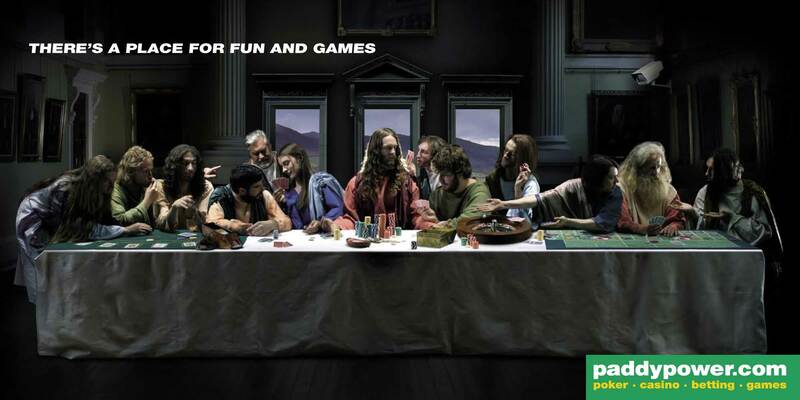 In the Senate, 9 July 2009, he refers to "the advertisement by Paddy Power, which showed a picture of the Last Supper. I think that kind of thing is unnecessary and gratuitously offensive to people. ... I do not think that should be allowed in society and it does not matter what religion it offends." He absurdly says: "I regard myself as a republican and the essence of that is tolerance for other viewpoints." And then he votes to criminalise "blasphemy": "I do not think anyone will be a victim of this Bill. ... It does not interfere with the freedom of speech but it does provide that those who are grossly abusive or insulting on matters held sacred by a religion and cause outrage among a substantial number of the people when their intention was to cause such outrage will be guilty of an offense. I see nothing wrong with that." 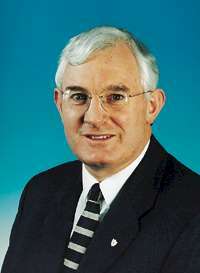 (*) He was the Ceann Comhairle, so would not normally vote, but would vote if there was a tie. 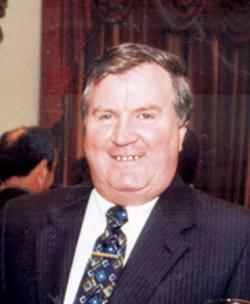 Irish politicians who appear on both the Roll of shame 1985 and the Roll of shame 2009. The following voted to make blasphemy illegal and to make contraception for unmarrieds illegal. Return to Sharia law in Ireland.